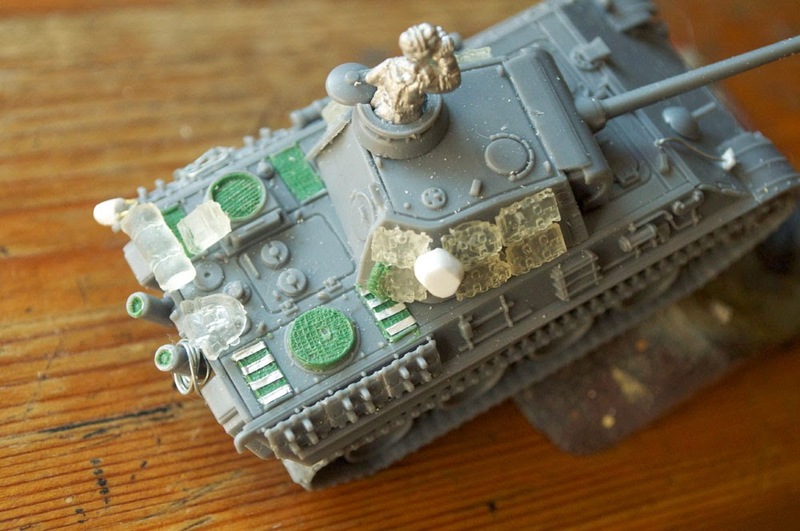 For my final post in this series (the painting post won't be a masterclass; there are many fine blogs and forum posts regarding that) I tackle adding stowage and odd little elements of detail to the Panther. 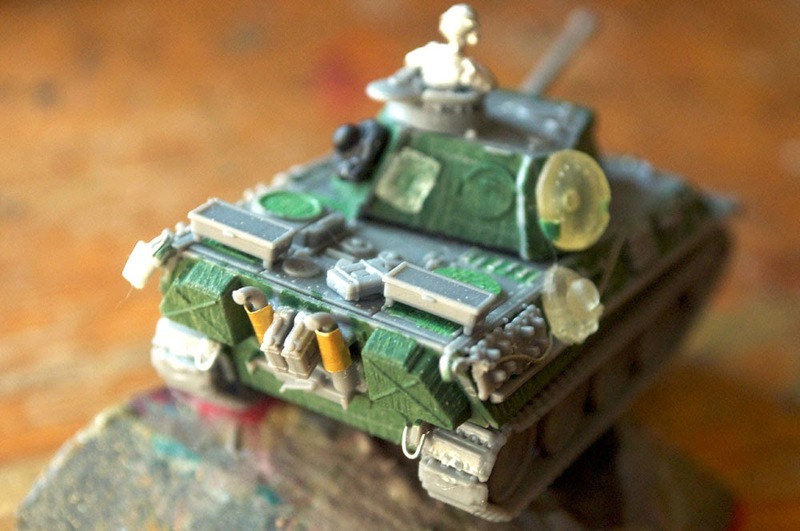 It would be highly unusual for a tank to not have stowage, and I'll go over each tank in my force, and comment on certain features that are unique.Almost all my bits of stowage are based off photographs, and I'll try to suggest how common each part would have been on tanks, based on either photographs or documents. I wish I had a better excuse for the delay on this post, but it was a case of 'something always came up'... On to the models! First something universal on my Panthers. 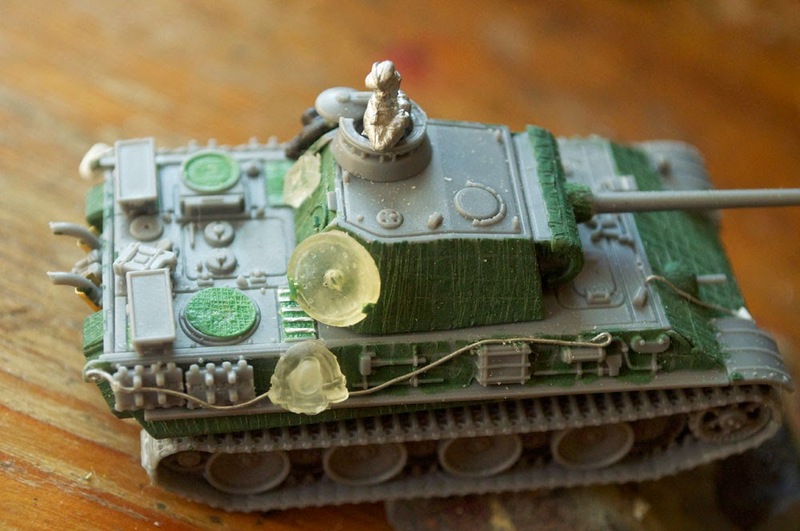 Here you can see the all-weather plug for the MG slot, which was attached to a cord by the radioman's head, pulling which would open the MG mount and allow him to attach and then fire the MG. On all my tanks I attempted to make the modeling wire look like string in how it lay, and the plugs are somewhat the right size. 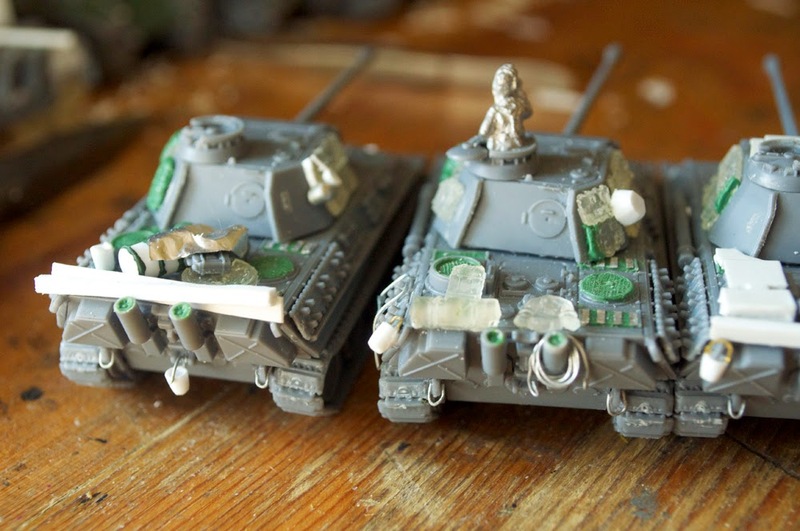 Similarly, all my tanks have tow hooks attached using the same modeling wire, carefully bent into hook shapes before being clipped and glued. While fiddly, the end result was well worth the time. These next few photos would have been photomerged, if CS4 wasn't somehow worse than CS3 for attempting photomerges. My hope was to just have all the rear ends in one go so I could talk as I went down the line. Ah well. Here on the leftmost you can see unbogging logs strapped to the back, and a bucket attached to a rear tow-hook. Fun fact about tanks: I have yet to see a Panther that isn't a wreck without a bucket. Every tank had one in some form or other. The second tank over has a tow cable wrapped around the flame hood, which was made by bending the ends of a length of wire over on itself, then looping the entire thing. Here you can see a second tank with unbogging timber, and an interesting element on the tank next to it; I have a photo of a (wrecked) tank with a ladder welded on over its exhaust! 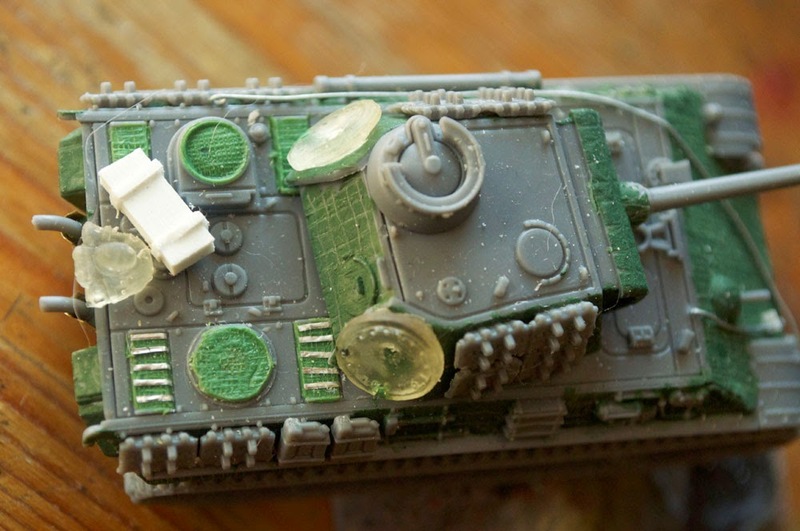 At first I wondered why the heck they'd want to have to climb over exhaust pipes to get on, until I figured it was probably to deter enemies climbing up during battle, and still let them get up and off when the tank itself wasn't running! Also, note the plethora of buckets along the back end. Since these photos the ladders got a coating of liquid greenstuff, partly to dull the edges of the wire, and partly because I was having some trouble getting the glue to fully adhere. Hopefully that'll work! Now for the above shots. 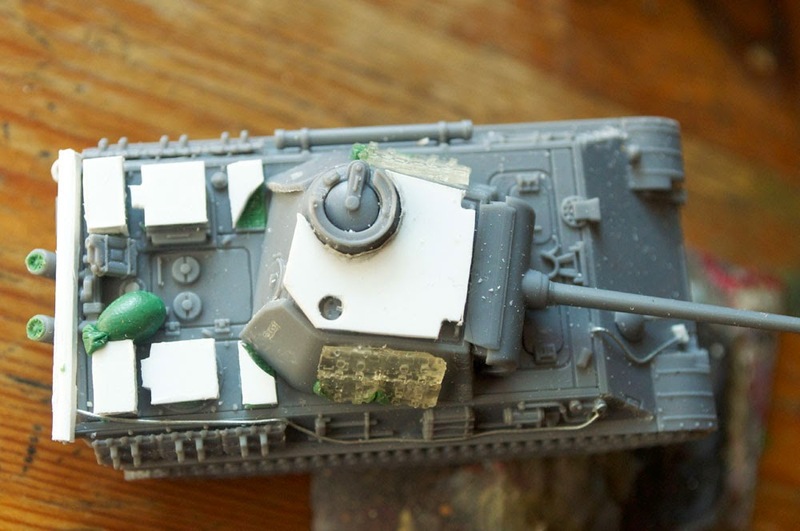 Here you can see two incredibly common elements of stowage: extra tracks on the sides of the turret, and the sides of the engine deck. This was because the crews believed they would help deflect shots or help with protection. It's up for debate whether it actually did help, but it was common. The other element that was incredibly common is what I call the mickey mouse ears, or awesome subwoofers; the extra wheels on the turret. These were part protection (again) and part 'somewhere to put them'. Also of note is the last element of my vent project that wasn't finished in time for the last shot; the slat covers on the right hand vents. It took some doing to make this work, as you can see on this one I have the wrong number and width of the pieces. This was a 'fun' mod to make. At some point the crews were officially allowed to, and started to make anti-aircraft covers for the tanks' vents. These were again fashioned out of pieces of schurtzen, and on the rear deck were meant to help stop lower-calibre bullets, and shrapnel, from entering the engine through the relatively unprotected rear vents. 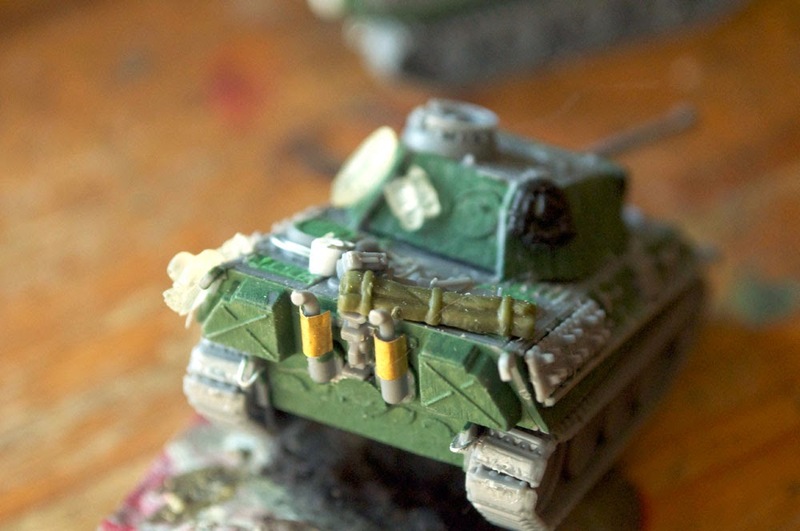 At the same time, they often added a similar spaced armour piece to the top of the turret, making sure to leave a hole around the anti-infantry projector slot, and turret hooks. Rather than cut incredibly thin pieces of brass to bend into shape, I just took my widest plasticard (1mm or so) and beveled its edges so that when glued in place, it would look to be only as thin as the upper edge, sloping away underneath. The rearmost vent covers are stacked two tall because of their shape. Here is my 'company cook' tank! He has a pair of cooking pots (one frying pan, one deeper pot) as well as a non-specific burlap sack filled with who knows what kinds of goodies. There's a tarp covering the bag, as well as an oil drum, a pair of jerry cans, and one of my cast extra roadwheels. (The tarp was necessary to cover a massive air bubble in the wheel!) While I've not necessarily seen pots and pans on the sides of turrets, I wanted to add something characterful, and I sadly have a very limited number of german helmeted heads! 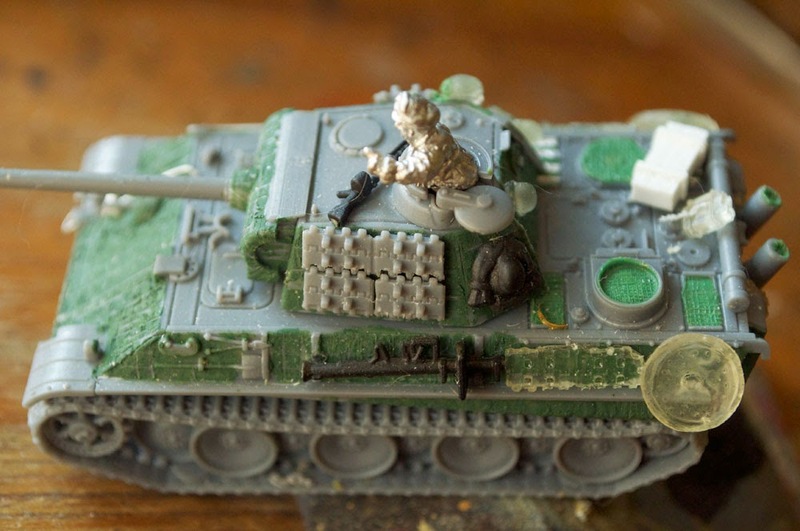 One of my platoon commanders sports a piece of stowage I knew I had to add when I saw it in a photograph; There is an image of a Panther tank with a wash basin attached to the turret! How could I not include such a hilariously random bit of kit? One of my other platoon commanders here with duffel, spare wheels, and a jerry can beside the rear turret hatch. Also with this panther are the rear-deck extra stowage bins. I have seen only one or two photos with these on the vehicle, in part because they were crew-crafted bins made from pieces of schurtzen or other scrap metal. As with the anti-aircraft plates, anything I've only seen rarely, I added just once to the company. Enough to try it, not enough to seem historically inaccurate. 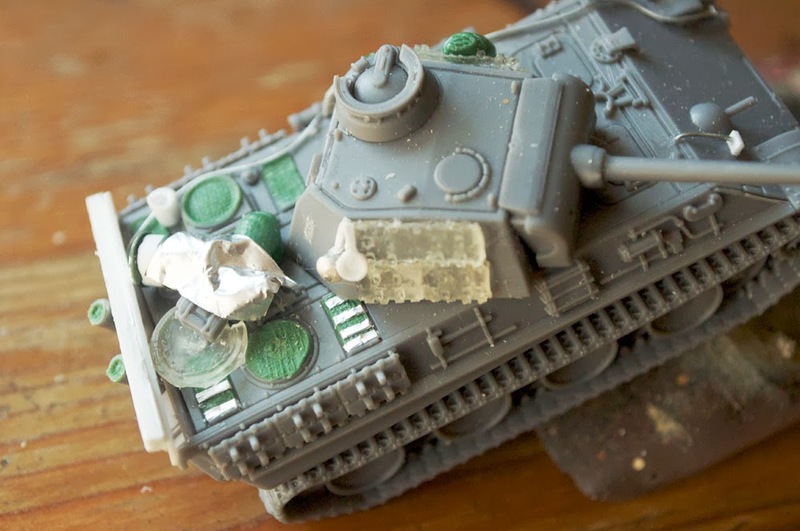 My CO, and hopefully my tank ace, has quite a few bits of fun stowage. 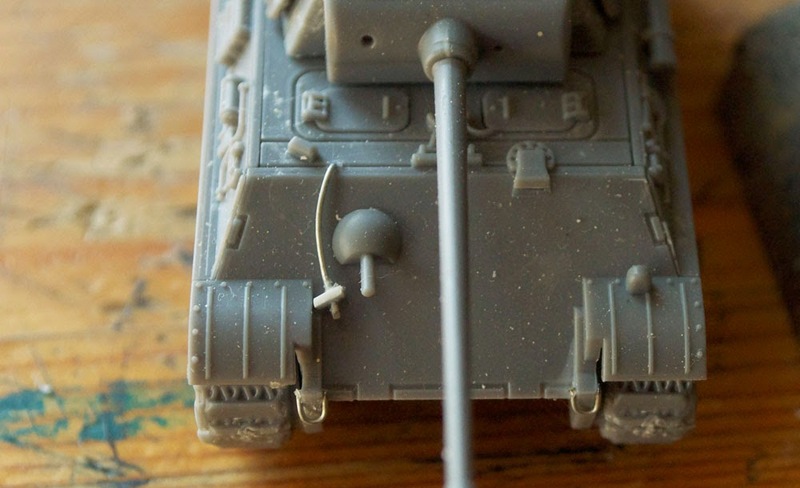 First he has a helmet on the back of the turret, so he can replace his fine officer's cap in a hairy situation. You'll also notice none of my Panthers have the AA MG, in part because Flames of War doesn't have it, and in part because it's historically a rare element. Despite that, he is equipped with a personal-use MG34 which I am claiming he has held on to in case he needs to defend his tank, or exit it under dodgy situations. It was common for crews bailing from their tanks to remove the in-tank MG34s to help ensure they got back to their muster points! More fun stowage on this one is a box containing extra tank shells (over-bright in the shot, alas, but painted it'll be more distinctive) and another relatively rare field-modification of moving the barrel cleaning rod tube to the back deck. The last fun element of borrowed/pilfered stowage: A German Panzerschreck! I had to replace the empty space of the cleaning rod somehow, and had a bunch of these left over from my Kfz. 251s. Here's the modified back end of the early-G with metal armour plates. Also visible are buckets, tarps, bread bags, a canteen, and a spare wheel. I tried to vary up where and how the wheels were applied so they weren't always ears/stereos, since it was often just one wheel on the tank. This tank was modified the other way, with the lower, lateral-mounted jack, and two jerry cans in its place. At first it may seem like I missed removing the mould line on the jerry can, but considering the way it was fabricated, this is how I can best represent the curious manufacturing folds. 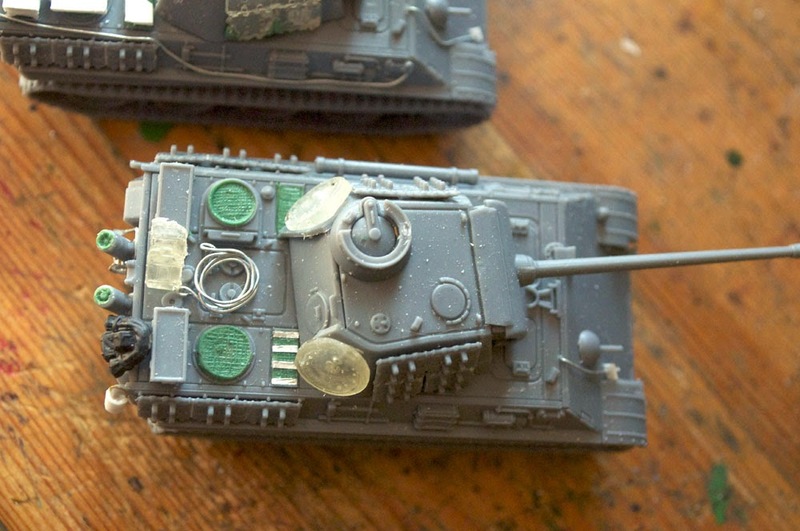 Finally, this tank displays another of the ammo stowage bins, and is a good example of what the slide-covers on the right side vents ought to look like. All of mine are open, as I must assume they would have been for battle, and here you can see the proper five slats, offset slightly. I did get a chance to use the crazy heat and humidity we've been having here to bury myself in the basement airbrushing, so the Panthers have since been airbrushed! 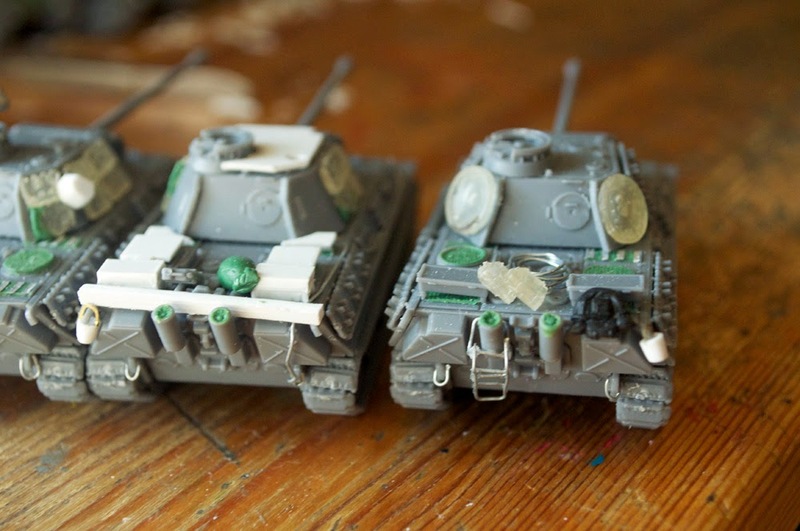 One platoon is painted with the red oxide colour as base, and the other platoon with the three-colour brown/green/dunkelgelb. At the moment, I don't think I'm quite pleased with the green in some of them (being frustratingly translucent, it came off too dark on the red, unsurprisingly) and the brown misbehaved a bit out of the brush, so I'll be touching them up. Rest assured though, there'll be another post up sooner than this one, as I have another project that just finished the conversion and is happily moving on to painting!